I am very much a beginner cook. I can follow a recipe, measure ingredients, mix everything together, and stick it in the oven… just don’t expect any miracles. JUP Girl Eats is less about me creating recipes and more about me testing and experimenting with ideas I see in magazines, cookbooks, and on TV. I am not a creative cook – I like to follow recipes EXACTLY – so you won’t see many posts here about a meal that I have created all on my own. (However, P and I did make some mean Paleo jambalaya-style lettuce wraps last week on the fly and they were incredible). P and I had friends over last night and I wanted to try a fall recipe to get everyone in the Thanksgiving mood. Even though the temperature was in the upper 80s, it was rainy so cozy bowls of Shepherd’s Pie was just what Mother Nature ordered. This recipe is from the November 2015 issue of Real Simple. I am a HUGE fan of Real Simple and I try their recipes often. They usually follow a similar formula, especially the ones with pasta and vegetable mix-ins. The Shepherd’s Pie was a major plus because I could make it in the slow-cooker. As I am sure you are aware, yesterday was the Junior League of the Palm Beaches’ “Deck the Palms” Holiday Marketplace, and after a long morning of shopping, a crock-pot dinner was ideal. 1 cup of Guinness (or any other dark beer). This was P’s favorite part of the recipe. 2 tablespoons all-purpose flour… JUP Mama, an excellent all-organic baker, recommends King Arthur Flour for all your baking and cooking needs. Combine the beef, carrots, onion, broth, beer, Worcestershire, tomato paste, flour, 1 1/2 teaspoons of salt, and 1 teaspoon pepper in a 4- to 6-quart slow cooker. … and, finally, add the Guinness, Worcestershire, tomato paste, flour, salt, and pepper. 2. Nestle the potatoes in the liquid. 3. 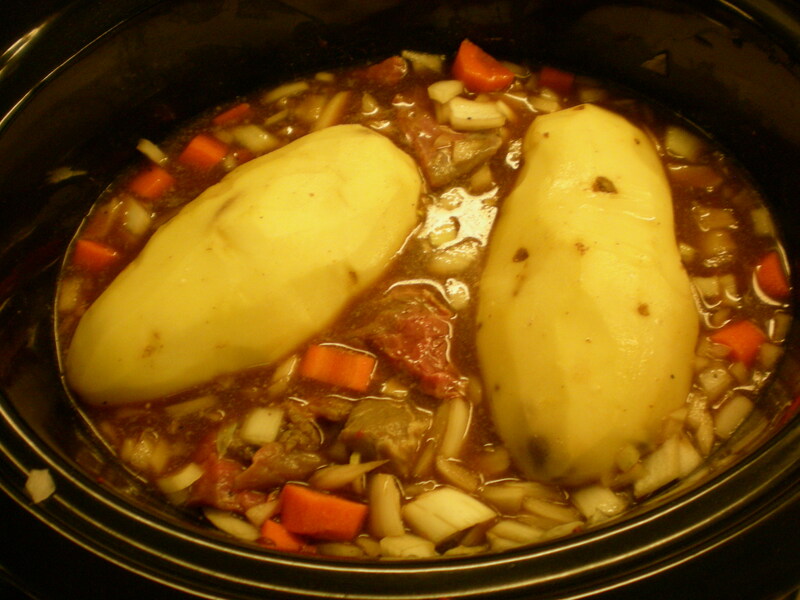 Cover and cook until the potatoes are tender, on low for 7 to 8 hours or on high for 4 to 5 hours. I choose the 5 hour option so dinner could be ready by 7 p.m. I am new to the whole slow-cooker / crockpot, “fix-it and forget it” idea. So, I did just that. I COMPLETELY FORGOT THE REST OF THE RECIPE. Yes, that’s why there are no more photos of Shepherd’s Pie after this paragraph. I hung up my purchase from Deck the Palms. My adorable dish cloth from Prep Obsessed. Our guests arrived and we opened a bottle of wine. 4. Once the potatoes are tender, transfer them to a large mixing bowl. I like to whip my potatoes (instead of mash). Add in the milk and butter and use a hand-mixer to whip the potatoes to your desired fluffiness. WARNING: Make sure your mixing bowl is big enough for your potatoes. I totally shot mashed potatoes all over the kitchen. In my rush to clean up the potatoes and get dinner on the table, I missed a very important step. I hastily spooned the Shepherd’s Pie into bowls and topped with a creamy layer of the potatoes. As soon as the bowls were on the table and we were getting ready to pray, it dawned on me…I FORGOT THE PEAS!!! HOW CAN YOU HAVE SHEPHERD’S PIE WITHOUT PEAS??? Well, we did. 5. Please don’t forget this step: After you remove the potatoes from the slow-cooker, stir in the peas and cover. Warm the peas until they are heated through, about 2 to 3 minutes. 6. Serve the stew topped with the mashed potatoes. We also served crusty bread on the side to soak up the Guinness flavored beef broth. YUM. Depending on the size of your crockpot or slow-cooker, I recommend doubling the recipe. Real Simple says it serves 6, but those people must not be very hungry. You can also freeze the leftovers (which we did not have). Clean up was a breeze. So when you try this recipe, please don’t forget the peas. Next Dreaming of a White (Sand) Christmas? Thanks Josh! We always have fun with y’all!